Or have a question, suggestion or would like to book a call with Dan & Rachel to help you get started? 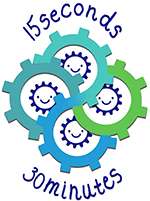 Send an e-mail to info@15s30m.co.uk or send them a tweet @15s30m, they look forward to hearing from you! This website does not store any personal user data and your e-mail goes only directly to Dan & Rachel. This website does not track any user’s personal behaviour nor does the it allow user creation for the public.